OK, folks – are you ready for a truly tough quiz? The verbs to lie and to lay are probably the most confusing verbs in English, primarily because they borrow from each other. And too many speakers and writers do not know which is which. 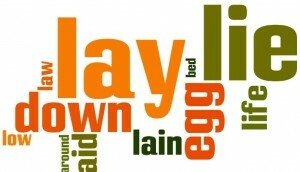 Once you’ve taken the quiz and have seen the answers, check out my post I published over a year ago — Lie, Lay, Lain: These Words are Such a Pain! — if you’re not sure why the answer is right. And you can always ask me; you know I will help you. 1. Paul (layed, laid, lay) the book on the table. 2. John decided to (lie, lay) down for a nap. 3. Earlier, Sarah (lay, laid, lied) down for a nap. 4. Karthik told me the cat was (laying, lying, lieing) on my bed! 5. Nicole said she had (laid, lied, lain) down all night. 6. Was Andrew (lying, lieing, laying) when he said he had paid that bill? 7. The chickens are (lying, laying) in the straw. 8. The chickens are (lying, laying) their eggs in the straw. 9. All of Maggi’s kids were (laying, lying) on the beach! 10. Jim (lied, laid) when he said he had paid those bills. 11. Milos should have (lain, laid, layed) the book on the table, too! 12. Trent’s mother (lays, lies) down for a nap every day. 13. Rod’s mom has (laid, lain, lied) down for over an hour. 14. Harley’s mom has been (lying, laying) down for over an hour. 15. After only a couple of hours, Frank (lied, lay, laid) down on the job! I do recommend using synonyms for these words if you can’t remember them; they’re really tough for many of us. If you’re still not sure about lie and lay, you could always say you slept well, you took a nap, or you rested comfortably. So, here are the answers . .. So, how did you do? Remember that while these are among the toughest verbs in the English language, you can learn how to use them.